As there seems to have been a bit of traffic on the forum lately, about case-hardening, I thought I'd add my two pennyworth. Nothing special, just an everyday job from work. But I had my phone with me, so thought I'd take a few pics. The threads on the end of this spindle have been damaged. Doesn't look much, but I've chased them out with a fine file, and still can't get the nut to spin on freely. If I force it I'll end up galling the thing up properly, and probably scrapping it. The thread is M16 x 1.25. An ISO-fine thread. There isn't a die nut anywhere on the firm to fit and the machine it's from needs to be back in action as soon as possible. Local tool suppliers say minimum 24 hours to get the right size die. 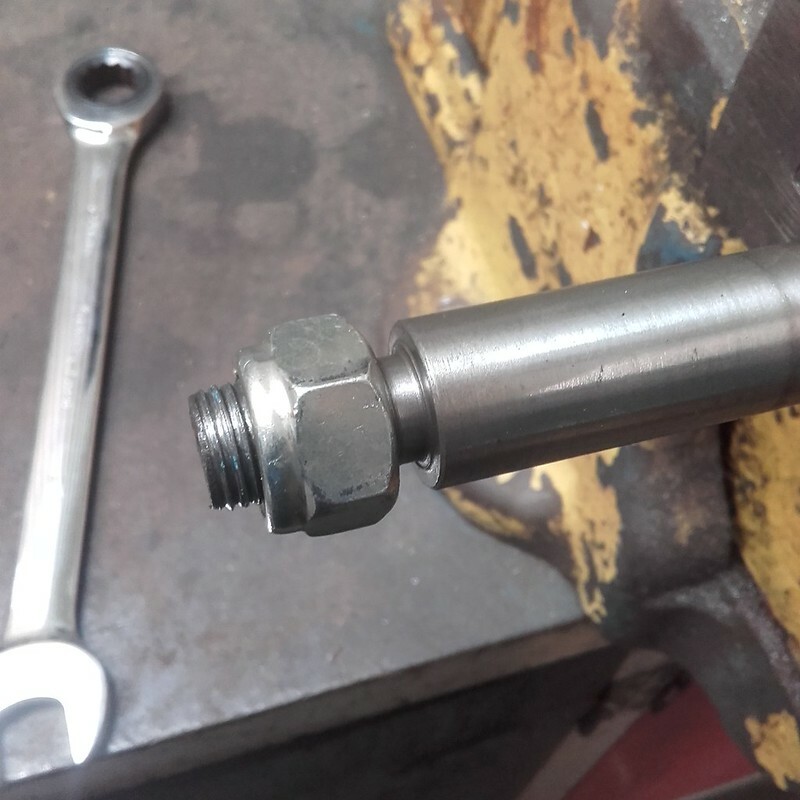 Have some spare nuts with the right thread, so it's time to improvise. Cut a diagonal slot to give a good rake angle. Warm to a nice cherry-red. I'm pretty sure this can has been with the firm longer than I have. We may retire together. Add a little of the voodoo powder and re-heat, until it's all been absorbed or burned off. The quench. For some reason my camera makes this look like it's white hot. It was actually a bright cherry red. A quick wire brushing to get rid of the oxide scale, a dab of cutting oil on the threads, and feed it on. 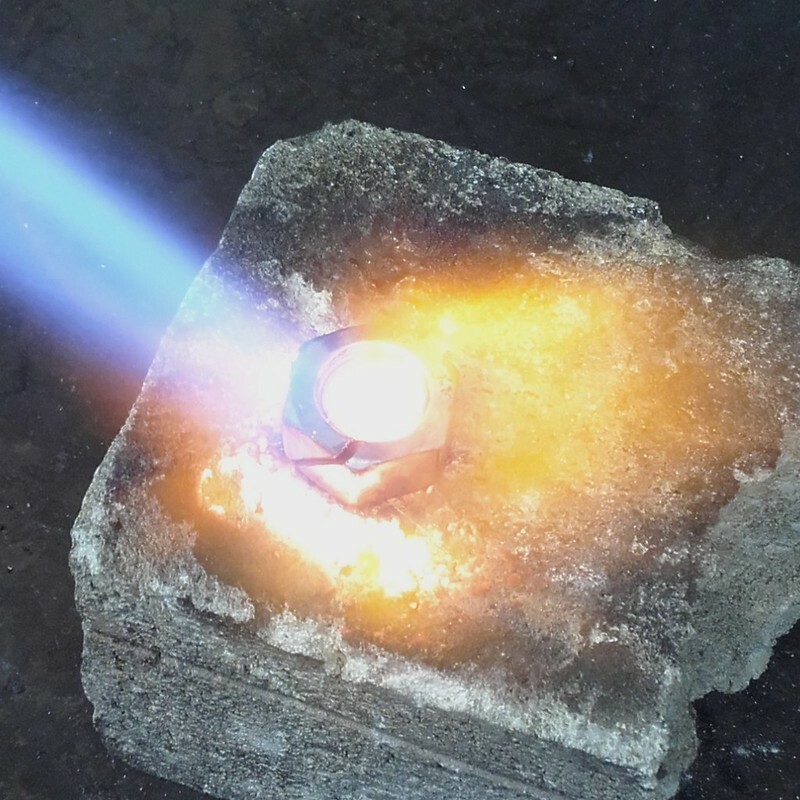 You can feel the difference, this is cutting the threads and making fine swarf, not just mashing the metal up. The proper nut now runs the threads nicely, no binding or snags. Soon the machine is back in action and everyone is happy. “Super Fitter” saves the day, again. 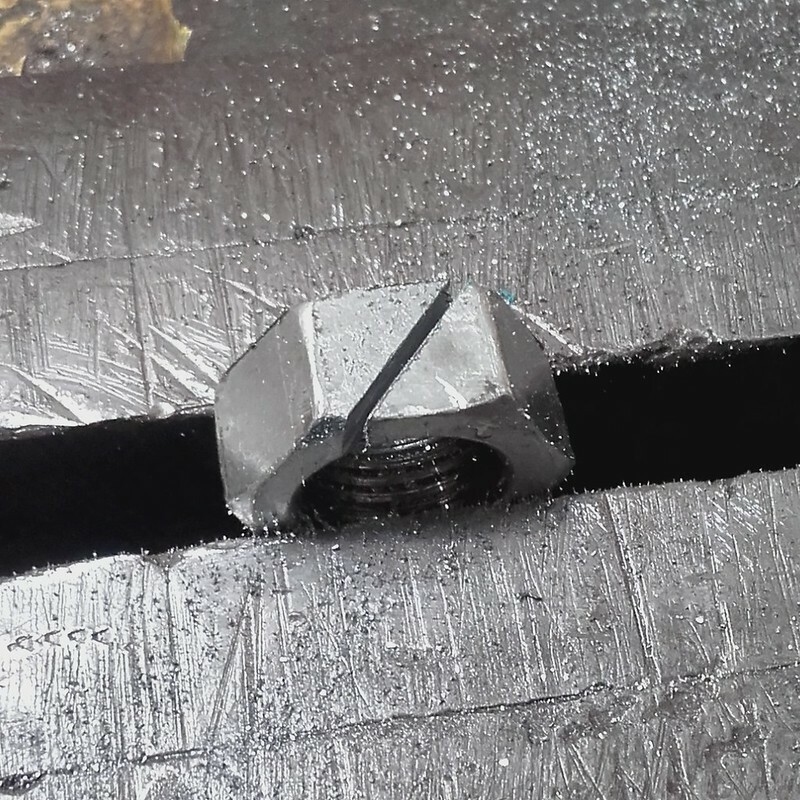 Re: Quick and dirty die-nut. I have a can of Kasenit which I'm very protective of. Mick - it may infra-red saturating the IR cut filter in front of the camera sensor, and the camera then maxing-out or auto-white-balancing. Nice work. Are you making its replacement in the meantime? It doesn't look like there was much left for threads there, so I'd not trust it to hold up for very long before stripping out again. I've done very similar for some damaged threads on some brass fixture screws using steel nuts, although I didn't need to harden mine. 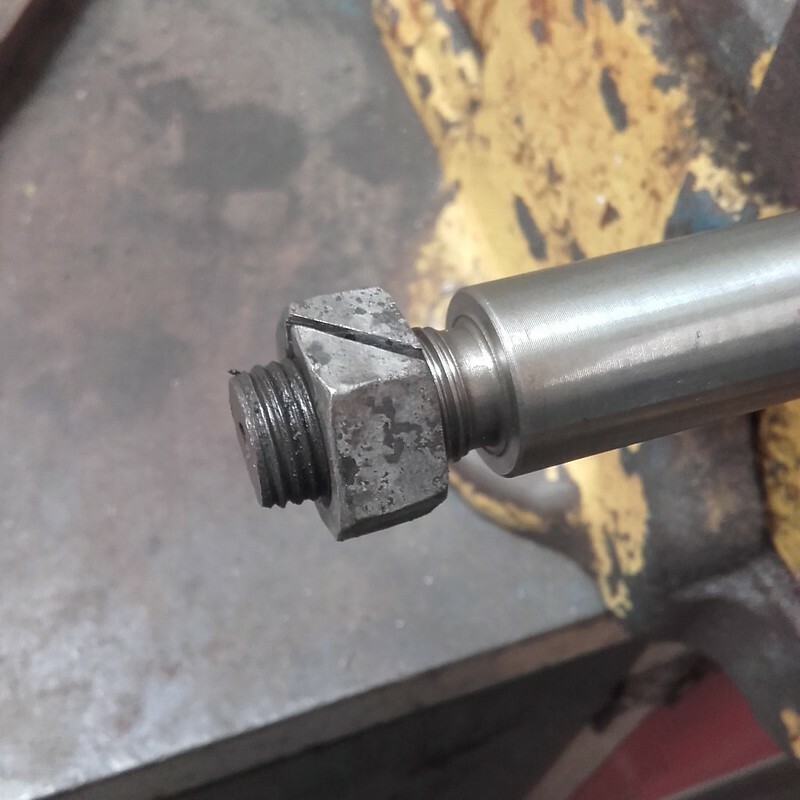 I countersunk one side of the nut as it seemed to help it engage the thread (damage was near the end). I was quite surprised at how well it worked, I was expecting it to be a quick fix until we got new fixings but the fixture is still in use months later. 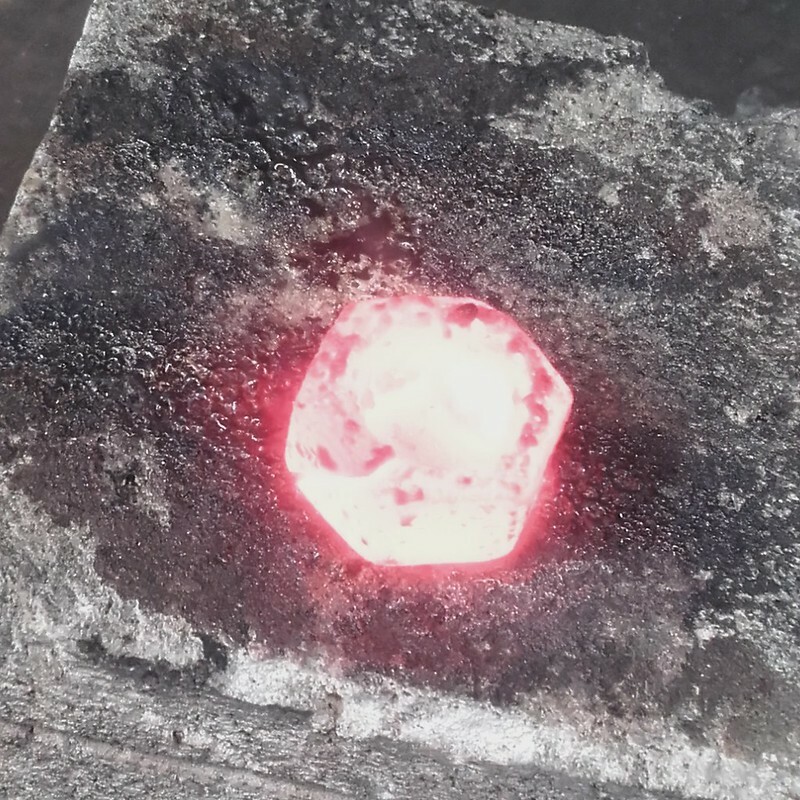 do or did they sell kasonite pre dented? dont think I have ever seen a properly round tin in my life. Exactly as designed! The manufacturers of the stuff hoped that once you had bought it that the tin would collapse and spill contents-- so that you would have to buy another tin. Again, I doubt that making cans( USA) and tins( UK) could economically make distorted out of round containers. I recall( very vaguely) pushing tinplate through solder horses- three high- and then they were split. Remember if the guys were trying to save minute amounts of cash by using negative torroidal seams( then) loomed. Somebody had already done a costing of just how thin the steel would have to be and more importantly, how thick the deposition of even more costly tin would have to - get away( my view) on the steel. On the other side of packaging there was something called- lightweight glass. Now, I'm sort of having a new workshop, my ersatz case hardening compound is in a plastic container- probably cheaper than the original 'tin' but designed to do exactly the same as the original tin- but the plasticiser would degenerate- and go to powder. I went past Durham Cathedral in the train a day or so ago, it was designed to last forever for the glory of God but we don't think that way anymore. 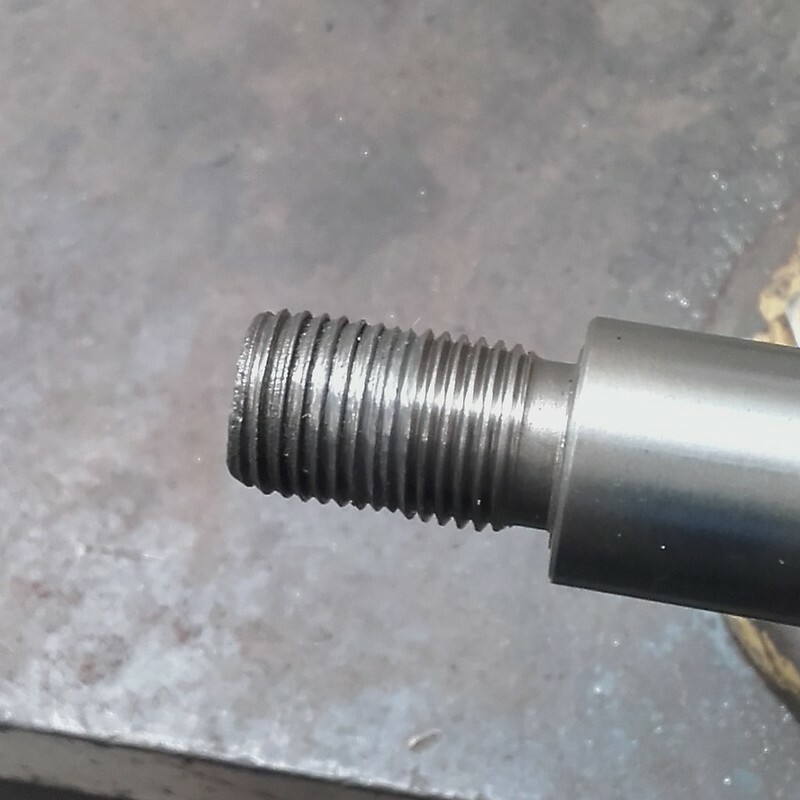 We don't mend poor quality steel in spindles and we roll the thread and have rattling good fits on nuts which are-- clears throat- radioactive from recycled metal originally designed to replace case hardening. Fun, init? Well, now the Brits are having to go to 68 to get their State pension-- or so it is said. I got out of the rat race at 55- my own case hardening was already wearing through. Nevertheless, it's a sunny day, here, today, Norman, and the family and I are going to clean up and paint the boat. And should I find a damaged thread anywhere in the next few years I intend to do as one_rod has! Good job, I haven’t seen a can of kasenit since I left school. 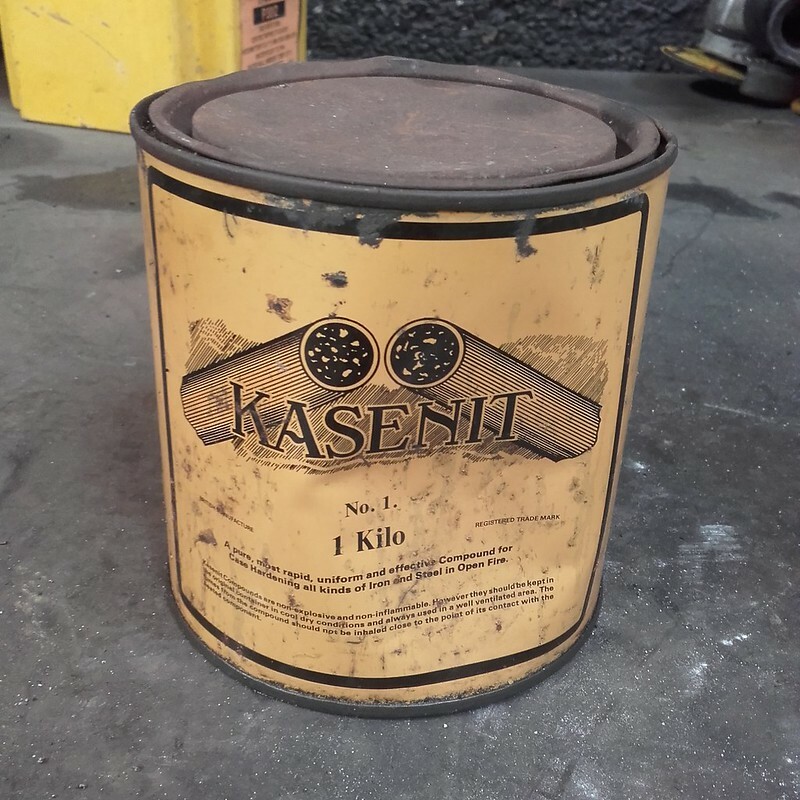 I'm jealous of anyone with an old tin of Kasenit. Following that line of thought i've just ordered some potassium ferrocyanide. Looking at old MSDS sheets for Kasenit it's listed at about 50% sodium ferrocyanide. MSDS sheets for the more modern stuff only list small amounts of potassium nitrate and chromium oxide (but not which kind). 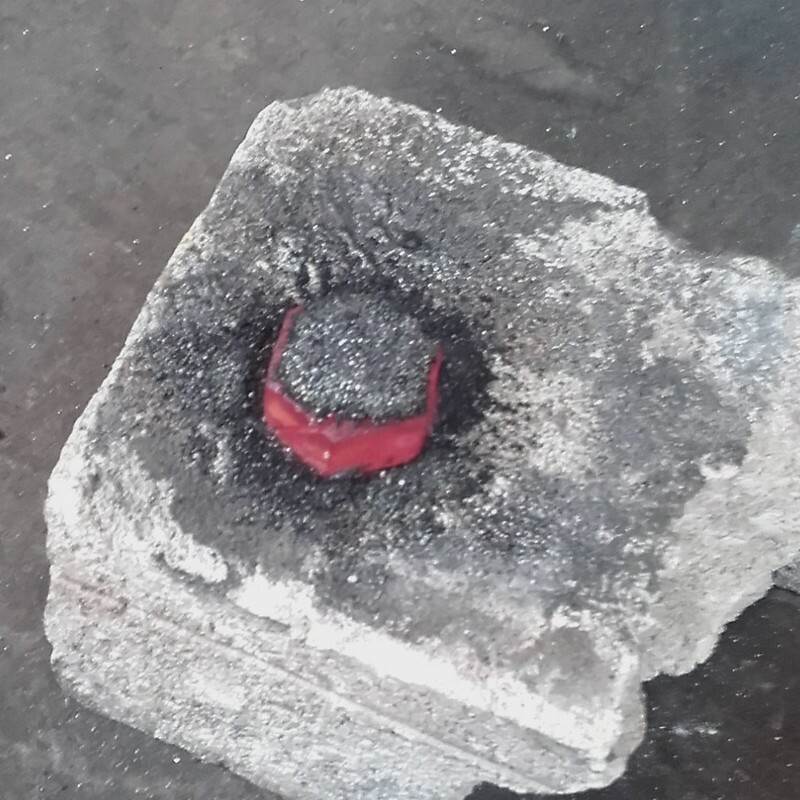 I've got a small amount potassium nitrate hidden somewhere so I could try throwing some of that in, but I wonder what makes up the other half of the old Kasenit. Going from the colour of the stuff it could just be powdered charcoal. 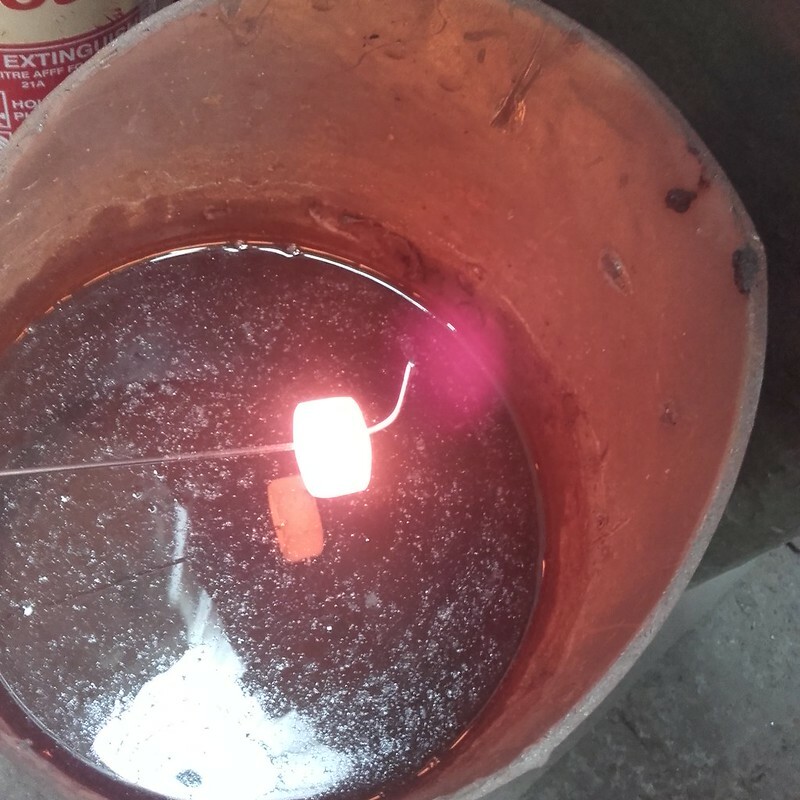 Sodium ferrocyanide melts at 400°C so I don't think anything extra will be in it to make it famously stick. I'd like to meet the person who first thought it was a good idea to pack stuff like this in plastic containers. Brazing flux is a particular gripe of mine. I get through quite a lot of the stuff at work. But plastic and hot-bench work just don't mix. One careless moment with the oxy-prop torch and there's another canfull heading for the bin. Spilt borax? You should have no trouble with ants. Of course, you could wash your dirty overalls in it. Bob, are you sure you didn't take a buck and body hammer to it? Since Cherry Red comes in a plastic container, I'm going to put it in a steel container and proceed to dent it, just to follow status quo. Found some dark powder in a glass jar on shelf at the back of my garage the other day. Normally inaccessible due my ever growing stock of hard wood. I did buy some Casenite 20 yrs ago from Tilgears, and have searched many times for it in the past. The label I put on the jar has now disappeared, and I have bought other similar looking substances since. I must test it to see if I have hit the jackpot.